Thanks Mom for the Welcome Home decoratations After being at the hospital for four nights, we were all ready to go home! Both Jackson and Noelle were released from the hospital on Monday night. Because of Noelle’s low blood count and Jackson’s jaundice, we didn’t have final word on this until Monday night. For those that have been asking – this is also why we don’t have many pictures of Jackson at the hospital. 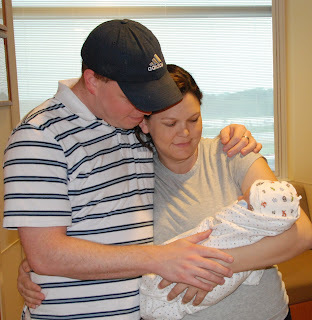 Since he had to be under the blue lights, the nursery would bring us Jackson to feed every three hours for thirty minutes, and then take him away again. We had very little time with our boy. But, the idea of going home was very nice! We were both looking forward to the fact that our house has a comfortable bed and no strangers! Too cute! You guys look great! Glad to hear you're back home. I still can't believe how CUTE he is!!! Noelle -- let me know when you're up to a visitor! Great family pics! I'm so sorry y'all were in the hospital so long. I'm glad you're finally home. Sleep when he sleeps!